Collective bargaining generally includes negotiations between the two parties (employees’ representatives and employer’s representatives). Collective bargaining consists of negotiations between an employer and a group of employees that determine the conditions of employment. Often employees are represented in the bargaining by a union or other labor organization. 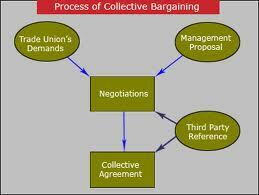 The result of collective bargaining procedure is called the collective bargaining agreement (CBA). Collective agreements may be in the form of procedural agreements or substantive agreements. Procedural agreements deal with the relationship between workers and management and the procedures to be adopted for resolving individual or group disputes. This will normally include procedures in respect of individual grievances, disputes and discipline. Frequently, procedural agreements are put into the company rule book which provides information on the overall terms and conditions of employment and codes of behavior. A substantive agreement deals with specific issues, such as basic pay, overtime premiums, bonus arrangements, holiday entitlements, hours of work, etc. In many companies, agreements have a fixed time scale and a collective bargaining process will review the procedural agreement when negotiations take place on pay and conditions of employment. Prepare: This phase involves composition of a negotiation team. The negotiation team should consist of representatives of both the parties with adequate knowledge and skills for negotiation. In this phase both the employer’s representatives and the union examine their own situation in order to develop the issues that they believe will be most important. The first thing to be done is to determine whether there is actually any reason to negotiate at all. A correct understanding of the main issues to be covered and intimate knowledge of operations, working conditions, production norms and other relevant conditions is required. Discuss: Here, the parties decide the ground rules that will guide the negotiations. A process well begun is half done and this is no less true in case of collective bargaining. An environment of mutual trust and understanding is also created so that the collective bargaining agreement would be reached. Propose: This phase involves the initial opening statements and the possible options that exist to resolve them. In a word, this phase could be described as ‘brainstorming’. The exchange of messages takes place and opinion of both the parties is sought. Bargain: negotiations are easy if a problem solving attitude is adopted. This stage comprises the time when ‘what ifs’ and ‘supposes’ are set forth and the drafting of agreements take place. Settlement: Once the parties are through with the bargaining process, a consensual agreement is reached upon wherein both the parties agree to a common decision regarding the problem or the issue. This stage is described as consisting of effective joint implementation of the agreement through shared visions, strategic planning and negotiated change.